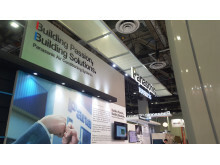 On 2-4 September 2015, Panasonic Air Conditioning Systems Company participated in the Mostra Convegno Expocomfort (MCE) Asia 2015 held at Marina Bay Sands Expo & Convention Centre, Singapore. 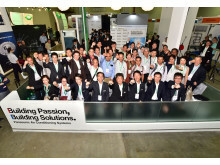 MCE Asia has successfully garnered 140 exhibitors and 10,000 visitors. 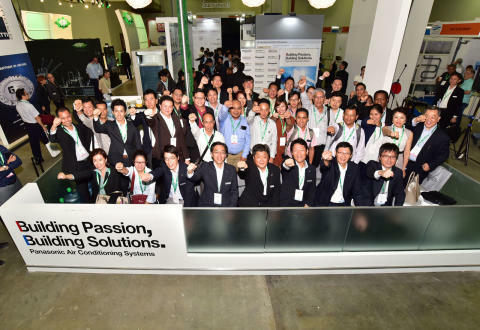 Panasonic leveraged on MCE Asia as the first dedicated International Trade Exhibitions to launch Panasonic’s commercial air-conditioner solutions in Asia. It also exhibited Smart Cloud Solutions, as well as other commercial and industrial air conditioners. Taking this opportunity, Panasonic invited business partners from around the world to witness and celebrate the launch. Mamoru Yoshida, President of Panasonic Air-Conditioner Company Japan, gave a keynote speech to officiate the FSV-Eco Extreme (EX) launch. 3D projection mapping technology was utilised to illustrate the system’s main features and benefits. He shared his vision to transform Panasonic into a market leader in the commercial air-conditioner industry. At the Smart Cloud explanation area, a demo connecting the system with Panasonic Singapore office and R&D Center in Germany was organised to highlight the system’s flexibility and ease-of-control. Yoshida also shared Panasonic’s successful case studies to demonstrate how the company plans to accelerate business. For example, Panasonic Appliances Air-Conditioning System Engineering Malaysia (PAPASEMY) was established in Malaysia on 16 Jan 2015 to drive B2B sales. PAPASEMY integrates R&D, manufacturing, sales, logistics, and service, aimed at maximising its value to customers. The company plans to develop more B2B sales platforms similar to PAPASEMY. Moving forward, Panasonic will expand its large air-conditioner business by offering solutions that use gas and electricity efficiently. The Air Conditioning Systems Company will continue to collaborate with sales companies and partners across the globe as part of its business expansion.